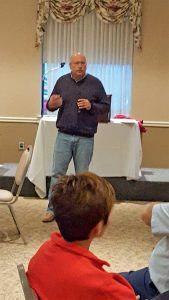 In November 2018 Perry Engineering held our annual Company Breakfast. This is a time for the entire company to fellowship, talk about what we’ve accomplished this year and what the road ahead might bring. A hearty breakfast is served that guarantees you will not leave still hungry. During the event employee length-of-service awards are presented and the Safe Crew of the Year is announced. While most companies struggle with high turnover, Perry employees have historically remained with the company for long careers. Our statistics show that 41% of our employees have 10 or more years of service, and 27% have 20 or more years of service. Six employees have been with us for 40 or more years! These days it is rare to see employee loyalty like we have. The Safe Crew of the Year is a prestigious and coveted award. Only one crew each year has earned it. In order to be considered for the award the crew must have been chosen as a quarterly award winner by their peers. 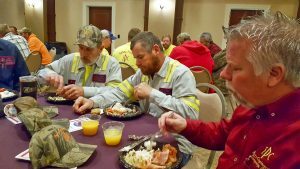 The quarterly awards, as well as the Safe Crew of the Year award, are based on the crews’ participation in our weekly safety meetings, weekly site safety inspections, and monthly safety suggestion program; the results of unannounced safety inspections; and the occurrence of preventable incidents and disciplinary actions. 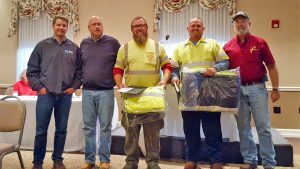 The winning crew for 2018, for the second year in a row, was the small grading crew of Tim Mullins and Jon James.